Cardbomb: Layering Fancy Dies with Hero Arts! Layering Fancy Dies with Hero Arts! Hey you all! One of the really fun things about Creativation was getting to play with amazing new products from our favorite stamp companies. I spent quite a bit of time at the Hero Arts Make 'n Take table and if you haven't seen their new catalog yet it is time to go check it out! One of my favorite things in this new catalog is this floral background die. It is so gorgeous! 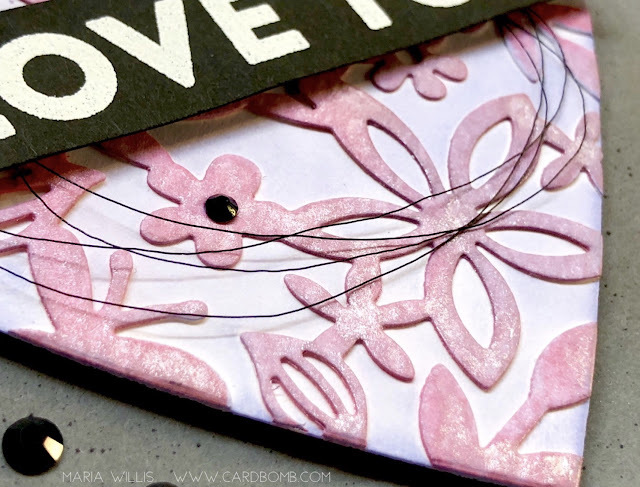 The die actually cuts out a large rectangle that fit on the front of a card but I wanted to do something different with it for today's card. First, the die cut was colored by ink smooshing using Hero Arts liquid watercolors in Strawberry, Pink and Mulled Wine. Then it was spritzed with the Hero Arts Pink Metallic Mist to give it some awesome shimmer. Then I adhered it to a piece of white cardstock and die cut a large heart out of it. I wanted to create a softer background so I gently blended some Distress Oxide ink in Milled Lavender onto the background. A little of it got on the die cut but it easily wiped off. Get a load of how gorgeous this die is!! In the picture below you can see how beautifully the watercolors and metallic mist have combined for a soft, elegant look. 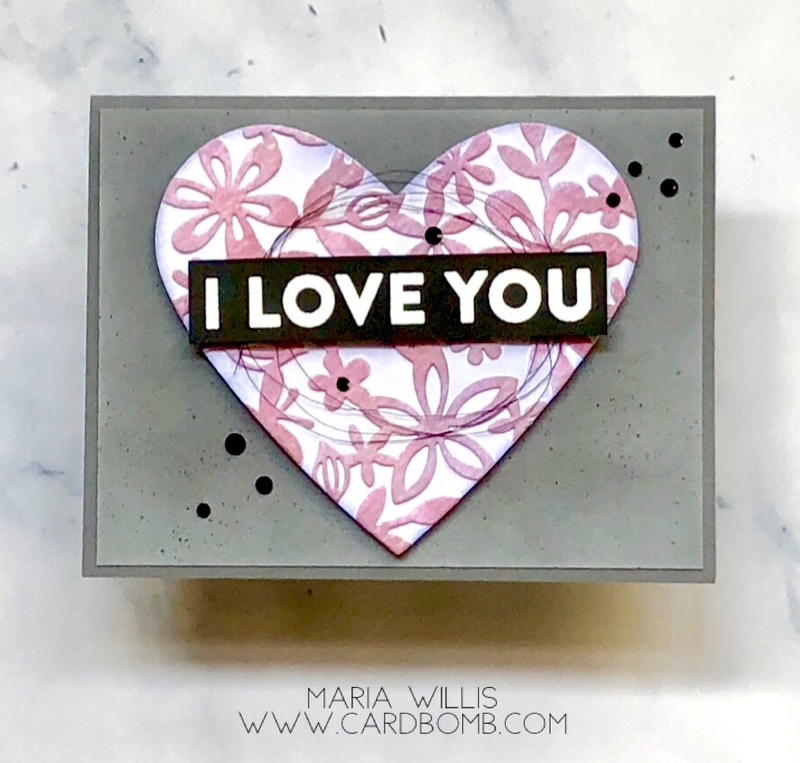 I heat embossed a sentiment from a Hero Arts sentiment set and popped it up on foam adhesive. I used foam adhesive to pop my heart up on a background that I sponged and splattered. black rhinestones and black metallic thread were the final touches to finish off this card. Have you seen the new Hero Arts catalog yet? What are some of your favorite things? 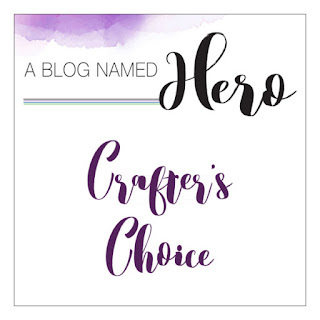 This month the A Blog Named Hero challenge is doing a Crafter's Choice challenge so you know I'm playing along! Click the graphic below to head over to their blog and check out the awesome cards made by their design team! Ok, I'm off to go pick up my son from school but I will be back soon! 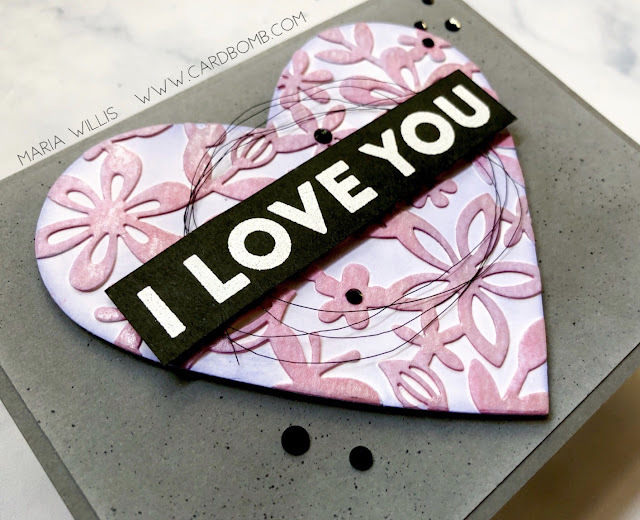 Beautiful card and I love the die and the gorgeous pink. Great job and thanks for playing along with us at A Blog Named Hero! Thanks Ericka! I always love joining the A Blog Named Hero Challenge! Goodbye Sweet Pup-You're My Lucky Star!